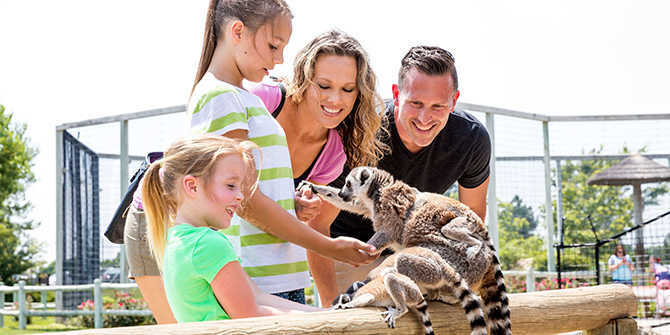 Whether you’re the type of family looking for action, animals or affordability, you’ll find Wichita is a great destination for your next family vacation. Morning/Afternoon: Spend a day exploring a few of the 33 museums in Wichita, from art to history, science and more. You can see one of the most complete Tyrannosaurus rex in the country at the Museum of World Treasures. Ask at the admission desk for scavenger hunts for your kids’ age groups, then make your way through three floors with thousands of artifacts from around the globe. Our interactive science center, Exploration Place is opening its most extensive new exhibit in December. The $2 million Design Build Fly exhibit is a 5,100-square-foot gallery designed to feel like you’re inside one of the city’s aircraft factories. Exploration Place also has a Boeing Dome Theater and Planetarium with daily shows. Evening: Who can pass up free and fun? Visit the icon of Wichita: the 44-foot-tall Keeper of the Plains steel sculpture by Blackbear Bosin that stands at the confluence of the Big and Little Arkansas rivers. The striking sculpture is free to visit as is the surrounding plaza that features exhibits depicting the Plains Indians’ way of life and representing the four elements essential to life – earth, air, water and fire. At nightfall throughout the year, the Ring of Fire surrounding the Keeper of the Plains is lit for 15 minutes. From May through October, another free downtown Wichita activity is watching the dancing fountains at WaterWalk. The fountains’ 1,200 nozzles put on a 10- to 15-minute show choreographed with lights and music at noon, 8, 9 and 10 p.m. Thursday through Sunday. Check the wind before you head out; the show doesn’t go on if wind speeds exceed 15 mph. Morning: A must-see on any family vacation to Wichita is the Sedgwick County Zoo, the seventh largest zoo in the country with 3,000 animals and 250 acres of exhibits, including the recently opened Elephants of the Zambezi River Valley. You can spend the better part of a day here or spend just a couple of hours, stopping at your group’s favorites. Click here to read how one family with three children navigated the zoo and why they recommend visiting the zoo before going to Tanganyika Wildlife Park. Afternoon: Let the kids burn off any remaining energy at Aviate Extreme Air Sports inside Wichita Sports Forum. The trampoline playground has 20,000 square feet of foam pits, obstacle courses, dodgeball, flying trapeze and other activities. They are open daily and offer specials most days of the week, from Monday’s Family Night package ($35 for four) to Club Aviate nights featuring black lights, glow lights, laser lights and music on Friday and Saturday. Morning: Another animal experience in Wichita? Yes, besides the zoo, Wichita is home to Tanganyika Wildlife Park and its tagline “A Wildly Different Experience” rings true. It’s smaller and more interactive. Why choose between the two, go to both! Click here to read what another family with three kids discovered on a trip to Tanganyika. Afternoon: If your kids haven’t tried indoor rock climbing, you will be amazed at how well they do at Bliss Climbing and Fitness, Wichita’s full-service indoor rock climbing gym. The staff here are great with those new to the sport and can help advanced climbers find a challenge, too. The facility had a 38-foot top-rope and lead climbing wall, auto-belays and a 15-foot bouldering wall. Click here for a listing of more family vacation ideas in Wichita. Also on our website, find Wichita hotels that meet your family’s needs and family-friendly Wichita restaurants. Looking for a cheap family vacation destination? Learn about Wichita’s most affordable activities by clicking here to read our blog post Wichita for the Budget Traveler.